Although algae is not a primary food for many pond fish, most species will still consume small amounts when available. The presence of algae in your pond doesn’t have to be a bad thing. In fact, when properly controlled, having some green algae (not the blue-green kind) in your garden pond is actually considered healthy and necessary for aquatic ecosystems as they will photosynthesize, produce oxygen, and provide a natural food source for many fish, insects and wildlife species. If allowed to grow out of control, however, algae can kill everything in your pond as it uses up all of the nutrients and dissolved oxygen content. Utilizing various pond fish, like the ones discussed below, is an environmentally friendly, simple way to ensure that algae populations are kept at a balanced, sustainable level. Although no pond fish will likely be able to fully control a rapid algae bloom (more on this later), they’re a great natural method for reducing it’s growth alongside more traditional means. Before we get to the best algae eaters, it should be noted that when feeding your fish, make sure that you are not feeding them any more than they can eat within a five minute span. Any uneaten food will add nutrients to the water, further encouraging algal growth. Plus, fewer supplemental feedings for your fish means that they are more likely to feed on any algae that is present. Making use of an automatic feeder can be helpful in these situations to carefully monitor dosage and frequency. A Common Pleco. Photo by Raphaël Covain, available under a Creative Commons Attribution-Share Alike 4.0 International license. Q: Will they Eat Algae in Ponds? – Yes, readily. As a pond owner, a pleco can quickly become your best friend, particularly if you live in a temperate region where algae is more likely to thrive. As mentioned in a previous article about mosquito control, a single adult plecostomus can eat a huge amount of string algae per 1,000 gallons of water, though this does depend on the species of pleco and how much other other food they’re being given. The common pleco (pictured) is one of the largest species at 1-2 feet long, and so logically will eat more algae than the 4 inch bristlenose pleco, which is another popular pond choice. Plecos are easygoing and peaceful, getting along well with most other fish species, though they do best in environments where they’re the only of their kind. Try to only have one pleco per 1,000 gallons of water, particularly if you have one of the larger varieties of the fish. They’re a tropical fish hailing from South America, and so they will have to be brought in for the winter if your pond’s temperature falls below 50°F. A Siamese Algae Eater – Photo by Dornenwolf, available under a Creative Commons Attribution 2.0 Generic license. The Siamese algae eater belongs to the freshwater carp family and, as its name implies, is one of the most popular and adept algae consumers for freshwater environments. They’re not picky eaters, and will happily eat all types of algae, from string algae and algae clumps to red algae that many other fish species shy away from. A rather spirited and social species growing up to 6 inches long, they may not pair well with smaller or more docile fish, such as guppies, minnows, or smaller cat fish. They often live full lives spanning up to 10 years, but require water to be kept between approximately 70 and 79°F and will need to be transferred to an indoor tank during the winter. They’re suitable to be kept with common goldfish and koi, and would make a good addition to most ponds if you can accommodate their warmer temperature requirements, or if you live in a warm climate all year round. A Pond Loach – Photo by OpenCage available under a Creative Commons’s Attribution-ShareAlike 2.5 license. Q: Will they Eat Algae in Ponds? – Yes, conservatively. If you’d rather not worry about having to transfer your algae-eater inside for the winter, a pond loach (also known as the dojo loach or weather loach) may be more suited to you. They’re quite hardy fish, able to live in waters ranging from about 40 to 77°F, and are well-suited for beginner ponders. They can grow up to a foot in length and prefer to live in small groups, although they should be fine in a community of other species so long as they’re docile. Loaches don’t consume as much algae as species such as certain plecos since they are opportunistic feeders that will also eat insects, plant matter, and food pellets. However, they’re one of the few algae eaters that can not only live in, but prefer, cooler water, which makes them a great choice for pond owners with cooler weather throughout the entire year. If you have really cold winters, it’s still best to bring them indoors where possible or install a pond heater to keep them comfortable. Koi and goldfish belong to the same family of carp, and will eat algae mostly in winter during hibernation. Q: Will Koi & Goldfish Eat Algae in Ponds? – Yes, conservatively. 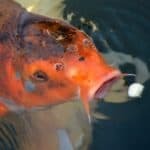 Being two of the most commonly kept pond species, you’ll be happy to hear that both koi and goldfish are omnivores and will indeed feed on algae to some extent. However, algae is certainly not their preferred food source and generally they feed more heavily on algae only during the winter when they are more dormant and there are fewer food options available. In warmer months, both fish species will prefer to eat their regular feed and various pond insects that happen to end up in your water garden. Having more goldfish or koi in your pond will help ensure that more algae gets eaten,but you may want to also incorporate other algae-eaters as well if you have a significant amount of algae growth. Plecos generally do just fine with koi, but can inadvertently latch onto smaller goldfish and damage their scales and necessary slime coating if there isn’t much swimming space in your pond. If you’re worried about the potential problems of adding more fish species, we recommend using other methods of algae control as both goldfish and koi really do prefer other types of grub! Guppies, including endlers, as well as mollies can make good algae eaters in small ponds. If your pond doesn’t have a significant algae issue and you’re looking for smaller, attractive fish, mollies and guppies are a good choice. Like koi and goldfish, algae is not their main diet but they will eat soft green algae off of your pond liner, rocks, plants, and other substrates. In addition, they’re both considered easy species to take care of and will reproduce fairly quickly, meaning that these little guys can put a surprising dent in overall algae growth. If you wind up with too many of them, most pet stores and aquariums are willing to buy mollies and guppies. They will need to be brought inside for the winter, as mollies prefer water above 75°F and guppies do best in temperatures over 55°. If you have a very small water garden, they’re probably one of the most effective (and cheapest) fish species for controlling algae, and will also help keep mosquito larvae and other insects at bay! In larger ponds, they’re less useful as they’ll be readily eaten by larger fish and likely won’t be able to keep up with the algae spread. An Oto Catfish – Photo by Fremen available under a Creative Commons’s Attribution-Share Alike 4.0 International license.. Many fish keepers and small-scale pond owners consider this little catfish to be one of the best algae-eaters out there! Although they are very small in statue, at only 1 to 2 inches long, they are ravenous when it comes to algae, and will happily eat the slimy brown algae and any newly growing algae as soon as it appears. Because of their small size and calm nature, they do well in groups with most other fish species and will not damage other fish as they feed (as mentioned above, this can be a problem with larger suckering algae eaters). They’re also gentle feeders, meaning that they can get to algae in hard to reach places without harming the plants in your pond, which may be useful if your pond has plenty of nooks and crannies. Not really a good choice for large ponds with bigger species as they’ll get eaten pretty quickly and won’t make much impact on algae growth, but they’re a good choice in smaller water gardens. Also, they’re best suited for tropical climates when it comes to outdoor stocking, as they require warm water temperatures, ideally within the 72-82°F (22-28°C) range. A Chinese High-Banded Shark – Photo by OpenCage available under a Creative Commons’s Attribution-ShareAlike 2.5 license. A shark that eats algae? What? Actually, this fish (also known as the freshwater batfish) is more closely related to the suckering algae eaters talked about in this article than it is to actual sharks. As a bottom feeder, algae makes up the most significant portion of their diet. Batfish have a prominent, high dorsal fin that inspired its name, and bold, banded coloring that makes it quite eye-catching. Despite their ability to grow up to 4 feet long (don’t worry, they’re slow growers), they’re a peaceful species that easily lives in harmony with koi, goldfish, guppies, and many other fish species, and prefer to live in small schools of 3 or more of their own kind. In addition, they’re quite hardy and prefer cool water with plenty of hiding places, though anywhere between 55-75°F suits them just fine. Since they’re a very large species, you’ll need a decently sized pond to accommodate their growth, so this choice is only really suitable for very large (and deep) pond designs. Although only suitable for large ponds, grass carp are very effective for aquatic weed control. Originating from Asia, grass carp were specifically brought to the U.S. in the 1960’s to control aquatic weeds in waterways. However, they can breed very quickly. Thus, in many areas it is only legal to have triploid grass carp – that is, grass carp that have an extra set of chromosomes, thus rendering them sterile. This is of particular importance, as they are an invasive species outside of Asia and can wreak havoc on natural ecosystems if allowed to breed. Grass carp are voracious eaters of potentially problematic aquatic vegetation (like elodea and duckweed). While they won’t typically consume filamentous algae, they do readily eat chara (also known as muskgrass), a type of green algae that is commonly mistaken for a plant due to its plant-like structures. They look strikingly similar to standard carp, but there are a few characteristics that separate them. The dorsal fin of a grass carp is short with fewer than 15 rays (usually 7 or 8), whereas the common carp has more than 15 rays on a larger dorsal fin. They lack barbels, a feature that is present on the common carp, and are also larger, weighing in at an average adult weight of 55 pounds. For this reason, grass carp are better suited for use in lakes or very large ponds. Conclusion – Which Fish Should I Choose For Algae Control? The best pond fish for algae control will depend on your pond size, climate, water quality, and the amount of algae growth. As always, this depends on the climate in which you live, your pond itself (including pH level, size, plants, etc. ), and your personal preferences, as well as the amount of algae present. If you have a large pond or a significant amount of algal growth, more voracious, larger algae feeders like the pleco, Siamese algae eater, or Chinese high-banded shark may be better suited for your pond. If you have a smaller pond or don’t have a substantial amount of algae, more general species like koi, goldfish, mollies, and guppies will likely work just fine for keeping your pond ecosystem well-balanced. If your region experiences temperature fluctuations, semi-cold-tolerant species include batfish, the pond loach, guppies, koi, and some goldfish species. When choosing an algae eater, you’ll also need to be mindful of the fish already present in your pond – batfish and otocinclus catfish are friendly with other fish, but Siamese algae eaters may be too energetic and stress out any calmer fish present, while koi may eat smaller fish. Are Pond Fish Enough to Control All Algae? I live in Winlaw BC, and have a pond that is about 40 feet across, and 8-10 feet at its deepest. It is becoming algae infested, and I would like to add some fish which can withstand the winters, and will eat the algae. In the Summer we do swim in the pond if that is an issue. Any info, or suggestions would be greatly appreciated. That’s a pretty big pond! You could look into Grass Carp (not common carp – which look similar!). Grass carp are incredibly hardy, tolerate cold winters, and will eat all kinds of pond weeds and algae. They’re actually used frequently in the US and Europe for aquatic weed control in natural water bodies, but could also work well in large garden ponds in smaller stocks. We have a small pool we turned into a small pond where we have a couple turtles. We live in Georgia. What kind of algae eater would be best for us??? Georgia gets pretty mild winters, so most algae eaters would be suitable for your climate. However, the main problem I see here is that most turtles are predators, and will very likely try to eat (or nip) smaller fish species in their environment. Even adult common plecos (what I’d usually recommend for small ponds) may become prey depending on the species of turtle you have. I have a Natural Pool/Swim pond in Chesapeake, Virginia, US. The swim area is 12’x14′ and just over 4′ deep. The rest of it varies in depth from 12″-3′ in depth. The main pond portion is free form but overall dimensions are 14’x16′. There is also two upper settling areas that I keep water hyacinth in during the warmer moths; followed by a stream that spills into the pond. Currently I have 14 koi in the 14″-28″ range, one 10″ goldfish, and numerous mosquito fish. For plants I have several pond Lilly’s, rushes, arrowhead, and cat tails in the regeneration area along side the swim area. What would you suggest for an algae eater? This product contains a silica-based algae species called Diatom, which eventually works to out-compete regular nuisance algae. The difference between the two is that diatom is a great food for zooplankton, which in turn, are a favorite food for fish, insects, and wildlife. Once this new type of algae grows to a certain extent, and zooplankton begin to multiply, everything is simply kept in-check by the natural eco-system of the pond. May be worth a shot! Hey , my name is Chris . My family owns a coal company land reclamation pond. It’s thriving with many species of fish. The pond is about 1.5 acres in diameter and is 15ft deep at the deepest point. Our only issues we are having is mass algae growth and cat-tails. We placed 10 grass carp but recent rains have washed away most of the carp. We have 3 that have survived the past 10 years one has grown to just shy of 4ft in length. Just wondering if there is any other way to control the growth or if we should just get more carp. Did the 10 grass carp have any noticeable impact on the amount of algae while they were all present? If they did, a general rule of stocking grass carp for weed control is about 10-15 adult grass carp per per acre of pond water. Looking at your pond, you could probably get up to 20-25 grass carp in there quite happily, which would essentially be doubling your long-term weed control potential. I have a Chinese High Fin Shark in a 4,000-gallon pond, I might have two, but I haven’t seen the second one recently. Between the shark and the other fish, I have very little algae in my pond and I live in Southern California. Glad to hear your algae eaters are helping keep your pond in good condition. The Chinese high-fin sharks are a really interesting fish, and certainly one of the better algae eaters out there; especially for larger ponds. Out of curiosity, how big are your sharks at this point? I was surprised to see just how big these fish can grow. Even koi can appear dwarfed in size when they’re fully mature! I have an eight by eight by four pond with way to much alge there is just koi and goldfish I live in Leeds England. What kind of algae do you have? Is this predominately green water algae, or string algae, as well? You could try adding a few extra algae eating species, such as a bunch of common plecos, but if you have “way too much” algae already, I feel they won’t make a significant dent. When algae gets to certain point, no amount of fish will be able to graze it down, and you’d first need to get it under control with other methods before the fish can become effective at controlling it. My advise here would be a combination of UV clarifier (for green water) and pond vacuum (for string algae), and making sure water quality and nutrients are within good parameters. Too many nitrates (from feeding/waste) will make algae go crazy! Once algae is under control, you could add a few more fish to help keep it under control in preparation for next year. Since weather is getting colder now, you shouldn’t get any more significant blooms once the majority is removed, so it’ll be more about preparing for it’s future growth come warmer weather. In general, simply adding a UV Clarifier to the pond and making sure to reduce any excess nutrients through regular cleaning/water changes should be sufficient. Most algae eating fish will certainly help with larger forms of algae, but sadly won’t make a big impact on the small free-swimming green water types. I had some string algae in a small pond with koi and goldfish in it. In the main pond the fish kept the algae very short but in the overflow chamber the algae was very long and dense. I liked is as it helped with filtration and nitrate control. Then I added some red tilapia and all the string algae disappeared, even in the overflow chamber. I tried to get some string algae back but with no success. What would be the reason that all the string algae disappeared? How can I get it back? That’s a strange one! I know that most Tilapia species will readily eat filamentous algae, but if they can’t get into the overflow chamber, it can’t be that. Do you test your water parameters in the overflow? If so, what are the pH/KH parameters like? Algae growth will suffer (or completely halt) in very low oxygen conditions, as well as within more extreme pH ranges. For example, if your pH is close to 5.0 or as high as 9.0, you would be unlikely see much algae growth at all. Also, if temperatures in the pond suddenly drop, you may no longer see noticeable growth, as most algae species begin to suffer in temps under 60°F (16°C). Hi, I live In western Washington and dont have much of a algae problem, not sure if it has anuthing to do with this or not, but I have all natural fragrance free clumping and non clumping calcium bentonite and clay cat litter lining the bottom, but i want to add some different species of fish and algae eaters, I have a 275 gallon pond and keep fancy goldfish in it, so any ideas on algae eaters or other fish that are hardy are welcome as well! Yhe pond is about 6-8 ft long by 3-4 ft across and about 3ft deep. Thank you!